Back to Stavangerfjord on the "Homefleet Ships starting with S" page. Received from Bjørn Milde, Norway (from his postcard collection). Stavangerfjord in Harstad during the war - Received from Ørjan H. Johansen, Norway. Passenger vessel, launched by Cammell Laird & Co. Ltd., Birkenhead (Yard No. 821) in May-1917, delivered to NAL in Febr.-1918, 12 977 gt, 7527 net, 532.5' x 64.2' x 29.3', 2 x 4 cyl. quadruple exp. steam engines by the shipbuilders, driving twin screws. Passengers: 88 1st Class, 318 2nd Class, 820 3rd Class. At the beginning of 1923 NAL, formally established Aug. 27-1910, owned 19 ships and had become one of the largest Norwegian shipping companies, but economic collapse in the early 1920's hurt the company. Additionally the new restrictive immigration laws in the U.S. had serious effects on NAL's westbound passenger traffic, while at the same time other companies started competing services between the U.S.A. and Scandinavia. NAL was forced to look for alternative employment for their 2 passengers liners Bergensfjord and Stavangerfjord, and in 1925 the first cruises to North Cape, the fjords of Norway, Scotland, Iceland and the Baltic were arranged (Stavangerfjord had been converted from coal fuelling to oil in 1924). This would later become one of the company's most prestigious activities. 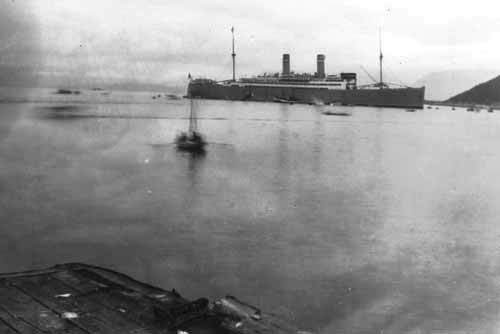 Stavangerfjord's tonnage became 13 156 gt, 7793 net in 1926. In 1932 she was fitted with 2 Bauer Wach low-pressure turbines by A. G. "Weser", Bremen. When Oslofjord came into service in 1938, it was possible to withdraw Stavangerfjord for modernisation the following winter, at which time her old tall, thin funnels, which reached to crosstree level, were replaced by slightly shorter ones (or did this take place in 1937?). Laid up in Oslo in Dec.-1939, then requisitioned by the German Kriegsmarine on Sept. 20-1940, and planned rebuilt as a hospital ship, but the rebuilding was not carried out, and she remained at the berth in Oslo as a troop depot ship (commissioned on Oct. 3-1940). Returned to NAL on Febr. 21-1945. NOTE: According to Roger W. Jordan she was indeed used as hospital ship from 1944, then VTS transport (Verwundetentransport schiff) from Sept. 20-1944. The picture on the right was taken in 1941. From another visitor to my website, his source: "Handelsschiffe im Kriegseinsatz", Herbert Baasch (b.1920-d.1997). Posted here with permission of the new owner of Baasch's photo collection. Stavangerfjord re-entered the transatlantic run as soon as hostilities ended in 1945. This original document from the National Archives of Norway shows her 1945 voyages, as well as some early 1946 voyages. She was at first used as repatriation ship, then overhauled and put back on the New York run, operating in this service alone until 1949 when the new Osloford entered service. When the new Bergensfjord was commissioned 2 years later, Stavangerfjord was given a major refit. Tonnage had become 13 304 gt in 1948, then 13 334 gt in 1951 and 14 015gt in 1959. Arrived at Oslo on Dec. 14-1963 on her last Atlantic crossing. Sold for scrapping in 1964, and arrived Hong Kong on Febr. 4-1964, under her own power, for breaking up by Patt, Manfield & Co. Ltd. (Laurence Dunn says she was broken up by Shun Fong Iron Works, Hong Kong). Demolition commenced in March of that year. 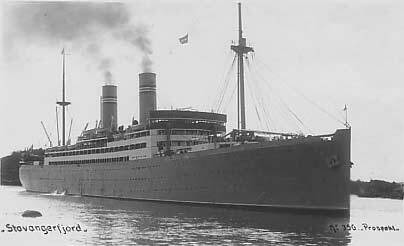 Norway Heritage Project has a section on Norwegian America Line with pictures and more details on dimensions etc. on several of the company's ships, including Stavangerfjord. Lots of pictures of Stavangerfjord, Bergensfjord, Oslofjord and other NAL ships through the years. The main page is entitled Simplon Postcards and has postcard pictures of a heap of other companies around the world, mostly post war, but also some that go further back. (Sources: Den norske Amerikalinjer fleet list, "Merchant Ships of the World in Color 1910-1929 [so entitled because it has color pics of the ships] by Laurence Dunn).